come on peeps im trying to become better....i posted my base " the side is the one i need help with " can someone tell me how i can improve "
Before you work on the side poses, I believe something else about your bases needs to be addressed first. I assume these are for- or in the style of a top down rpg base? You are taking common visual " tropes" or shortcuts that have been used in the past to represent features without taking into account the scales they were being used on. Most importantly is that you are creating an image of a human form that is being seen from the top, but are flattening it's features to normal proportions. In perspective, things farther away from you become smaller. In a topdown rpg, sprites of say 16x16 or 16x24 pixels don't really have to worry about such a problem because the " symbol" of a character is more important, but once your sprites get to the size you currently have them at, things will look odd if you don't take this into account on some level. 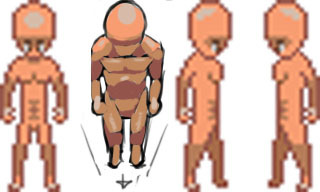 You most likely would not have to alter your sprites as drastically as I did to show the point- but right now the head floats on top of his shoulders and as you can probably tell, his torso is too long. What you are doing with the heads is good, but the bodies are currently appearing to be 2-dimensional sheets with muscles drawn on as opposed to a 3-dimensional human body.